Weapon systems on a warship depend upon the assigned role and mission of the warship in war. Generally, warships carry weapons to cater for threats emanating from the air, surface and underwater. For air threats like sea skimming missiles and air attacks, ships have surface to air missiles, guns in dual role, and close in weapon systems/point defense systems (multi barrel guns, short-range missiles). For surface threats, ships have surface-to-surface missiles and guns. For anti submarine warfare (ASW) ships have torpedoes and ASW rockets. Warships carry decoys for deception of enemy torpedoes and oncoming missiles, these comprise of chaff dispensers, infrared (IR) decoys, acoustic decoys etc. The warships also have an extended weapon capability on the helicopters they house on board; this could be a lightweight torpedo, rockets, or small caliber guns. The advent of weaponised unmanned vehicles is introducing another facet of weaponisation. Naval weapons are complex in design due to the corrosive sea environment in which they have to operate, severe space and weight restrictions, and problems of stabilization as the ship rolls, pitches and yaws. Further, as with all weapons, they cannot be procured just by paying the currency required by the manufacturers. The pricing of weapons is based upon the need of the country, its relations with the producing country, its position in the world at large and other considerations like, foreign policy issues, type of technology, availability of similar systems for sale in other countries etc. In case of India, it has been the experience that the weapon systems it desires are not available for purchase, alternates offered are exorbitantly priced, and those affordable are invariably not required by India. The ideal solution is local availability of weapon systems, which will ensure maintainability, timely upgrades, and modularity for warship design. The indigenous effort has still not matured to provide viable weapon system or even subsystem solution within the time frame and the budgeted costs. Economic viability, arms export policy and non-availability of technological prowess, appear to be the main reasons. India is left with no alternative but to import and also prolong use of existing armament by process of life extension, constrained with improper/insufficient spares, inadequate documentation and testing methods. Weapons thus continue to be deployed well beyond their useful life without ascertaining if or at all, or to what extent they meet the designed parameters. The Defense Procurement Procedure (DPP) has been promulgated to enable the Armed forces to timely procure the desired equipment with least drain on national resources. The DPP is being regularly revised to cater for changing Indian conditions. It has been structured so that the Indian defense industrial base is progressively strengthened by offsets, transfer of technology, and joint venture regimes. ‘The Long Term Integrated Perspective Plan’, LTIPP, of the armed forces, is an indicative acquisition plan for the next 15 years but without any commitment of funds or frozen requirements. The weapon procurement procedure commences with drawing the staff requirements, which the Defence Research and Development Organisation and industry claim are unrealistic, the armed forces justify it since weapons are used over decades and therefore once procured they should remain current and amenable to technological upgrades as long as possible. Perhaps the only way the Government of India can resolve this issue is through policy level intervention. One of the suggested ways is by categorizing external threats at two levels depending upon their severity & extent and thereafter specifying two types of procurement, one (say P1) to the staff requirements of the Armed Forces and the other to a level (say P2 through local sources only) which meets at least 75% of the staff requirements. Killability studies may be carried out to assess the numbers (with sufficient redundancies) of P1 and P2 types required to meet the threats in their entirety. Further, it can incentivize the P2 procurement by increasing the defense budget proportionately and set up an accountability mechanism for timely delivery, maintainability, and functionability of the same. 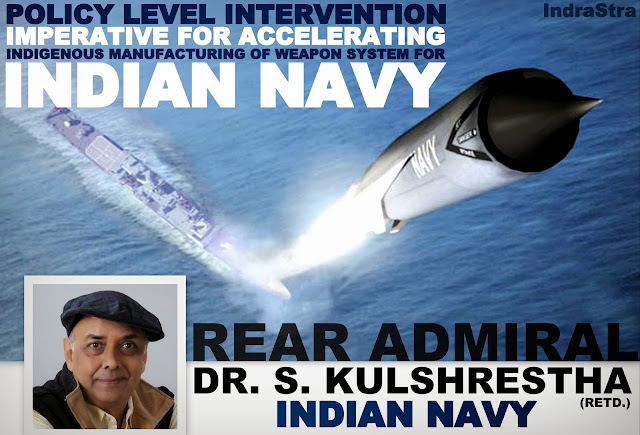 It suffices to state that weaponistaion of warships is undergoing a change today forced by factors like economic slowdown, emergence of littoral threats, reduction in blue water engagements, development of powerful sensors and weapons as well as advent of unmanned vehicles on the horizon. It is imperative that policy level intervention be initiated in procurement of weapons to ensure that the Defense Industrial Base in India is strengthened to levels where it can sustain the requirements of the Armed forces.